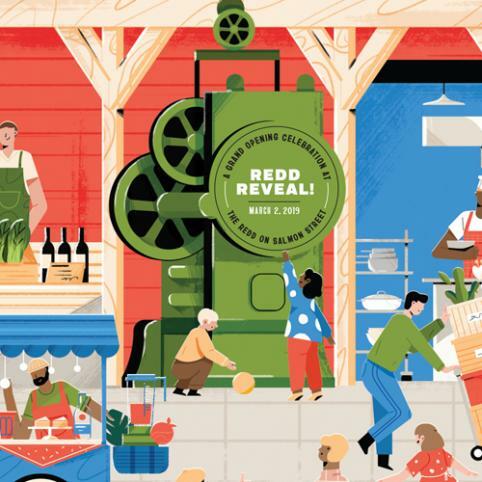 With both buildings on the two-block campus finally complete, the Redd on Salmon Street is emerging as a hub for the growing good food industry and community-inspired events. Four years ago, Ecotrust made a big bet and bought two blocks of Portland’s rapidly redeveloping Central Eastside. 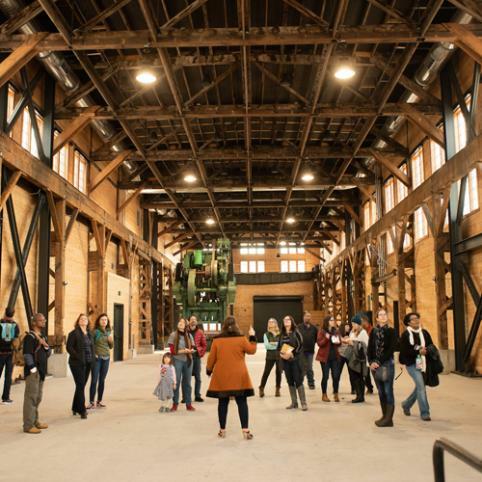 Those two blocks at SE 8th and Salmon were home to a marble warehouse and an historic ironworks, but our team — led by our founder, Spencer Beebe — envisioned the 76,000-square-foot campus as a working hub for the regional food system. I am proud to share that the Redd on Salmon Street is now fully open for business. It all started with some research. We wanted to know what it would take for regional regenerative ag producers — farmers, ranchers, fishermen — to scale their businesses in rural communities and provide more healthy, local food to eaters. What we heard loud and clear was that these food entrepreneurs needed right-sized infrastructure, better access to urban markets, and connections to the growing number of big food buyers — school systems, hospitals, grocery chains — interested in localizing their supply chains. We believe bringing local food to scale, done right, can nurture vulnerable communities, help shock-proof regional economies, and restore the lands and waters we rely on — we want to be part of that and we know that work doesn’t stop here. In need of a name for the campus that would enable these connections, Ecotrust’s Spencer dubbed the campus the “Redd,” evoking the riverine gravel beds used by Pacific-run salmon to spawn the next generation. Now, with the doors of Redd East open wide for gatherings of all types the Redd on Salmon Street is coming into full focus as a hub both for growing food businesses and for a community hungry to gather around a regional food system that is restorative, equitable, and delicious. With a community-ready campus, we’re ready to roll out the welcome mat and celebrate. Coming right up on Saturday, March 2, join us for Redd Reveal! — our grand opening. This all-ages event will feature bites and beverages from throughout the region (including from purveyors housed at Redd West), family-friendly entertainment, cooking demos, activities for kids and more! We’re also looking for some partners to help us host our shindig as sponsors. Learn more about this great opportunity to engage with a dynamic, growing community committed to and energized by the work of creating a more robust regional food system. With a warehouse full of amenities the Redd is primed to be the perfect place to host your next signature event. Designed as a landmark events center, Redd East encompasses more than 33,000 square feet of event space — from the Main Hall where the iconic green press holds court, to the community kitchen, outdoor plaza, and board room meeting space. While the beautiful details of this space are freshly in place, we come into this new phase of events offerings at the Redd with fond memories of intrepid partners, producers, and community members who joined us pre-renovation at events like the inaugural CSA Share Fair, Local Link, and last year’s Light up the Redd. Redd West has already been hard at work, serving the growing regional market for good food. 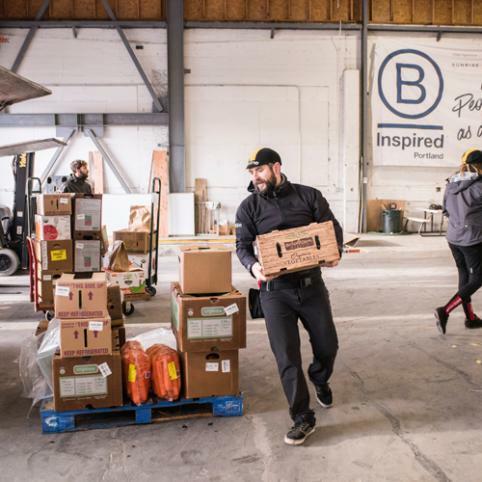 Managed by our partners at B-Line, the warehousing, cold storage, and co-working spaces are home to 170 food entrepreneurs who are building their business while collaborating with each other, giving back to the community, and utilizing regenerative practices that restore our lands and waters. In addition, Wilder Land & Sea offers distribution options for meat and seafood and Soup Cycle and New Foods Kitchen offer production kitchen space. The hub also hosts FoodCorps, which provides nutrition education and garden education at high-needs schools across the country. 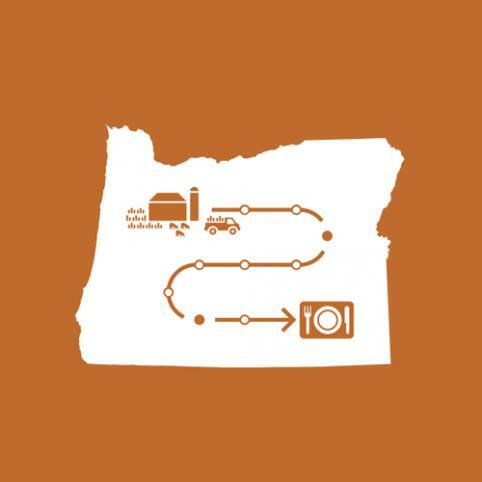 The Redd on Salmon Street grew out of a body of research that found there are significant infrastructure gaps for mid-scale farmers, ranchers, and food businesses throughout the region. In addition, we looked into both supply of and demand for regional food, focusing on Ag of the Middle producers who can provide wholesale volume with local values, and the opportunity to grow the market for their products among large-scale buyers like schools, hospitals, jails, and universities.